Comedian and Actress, Sunda Croonquist returns as host for this year’s Showtime! along with Tehran von Ghasri. Musical guests Megan McIver and Terence Deutsch will perform for us at the garden party. Thank you to Honorary Chair Bob Saget and Chair Marla Kort another great year of leadership, entertainment and prizes. Showtime! 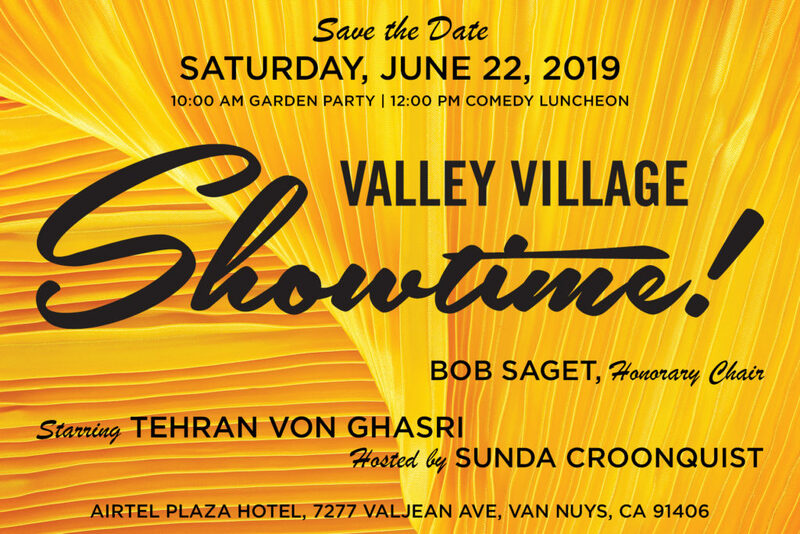 is Valley Village’s annual comedy show, luncheon and garden party, live music, drawings and auctions; benefiting 400 individuals with developmental challenges. Become a part of Showtime! by sponsoring the event. You can also participate by contributing an item or gift card from your business. Contact Jenny if you have questions about how to be involved with Showtime and our other events. A downloadable sponsorship packet is also available. Valley Village’s Showtime! event raises critical funds to support therapies, community-based outings, capital items like lifts and durable medical equipment, and core support needed to fulfill Valley Village’s mission to protect, foster, develop and advance the rights and interests of people with developmental disabilities. Our comedian this year, comedian Tehran von Ghasri, is one of the most dynamic entertainer newcomers today. Exploding on the scene hosting, performing, and throwing events from sold out comedy shows to rock concerts. His energy, excitement, and unique sense of humor have make him a formidable comedian/entertainer in his own right. Hosting highly rated TV and Radio programs, the 25 yr old sharp witted law student has been compared to a mix of Dave Chappelle and Stephen Colbert meet Maz Jobrani. Tehran has the best of both worlds. Hailing from the nation’s capital, Washington D.C., Tehran was born and raised in the United States to an Iranian father and a Black-Tehran-American mother. Our beautiful, generous and longtime host, Sunda Croonquist came to us through the Laugh Factory. Sunda is an author, comedian, host, personality, actress. After a chance meeting at a party, Jackie Mason suggested she head to the stage as a stand up comedian and she went from representing New Jersey as a runner up in the Miss America Pageant to being named NJ’s Funniest Female before landing roles on television and eventually getting her own talk show: “James and Sunda” which airs weekly on JLTV (Jewish Life Television)Hailed in the NY Daily News as being: “The only female comic that makes Jerry Lewis laugh”, Sunda still performs stand up in her weekly show “All Star Comedy” and hosts “Laugh Factory Moms” Podcast at the Laugh Factory in Hollywood. She is also the radio host of “Mother-tainment” on RadioTitans.com. Visit her at SundaLive.